Our company was founded in 1997 in Switzerland and we have a long experience in creating professional software solutions that you can trust. Thanks to its strong multilingual support, Planyo is used worldwide by all kinds of businesses taking online reservations with a wide variety of resources offered for rental. 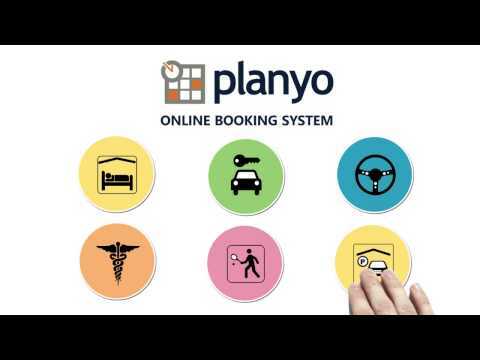 The planyo online booking system is used, amongst others, by businesses offering vacation properties, car rentals, hotels, driving schools, yacht charters, doctors and therapists, conference rooms, tennis courts, car parks, event tickets or any other bookings you could imagine. The first 30 days are always free with no obligations and no need to enter your credit card number. Our technical support is free. If you don’t like what you see after the trial, move on to another solution. We never require long-term commitment, before or after the trial. Planyo uses very secure and redundant infrastructure from the market leader Amazon AWS. Our service will be available even when an entire datacenter goes down. A highly customizable booking engine and channel manager with resource-specfic credit-card merchant account processing. Seamless and professional automated customer notifications. Powerful and dynamic pricing.The notification system is extremely powerful, and the numerous plugins for channel managing provide peace of mind over double-bookings. A unique feature is the possibility of having one merchant account per resource for credit-card processing. The system is reasonably priced and modular. The notification system is extremely powerful, and the numerous plugins for channel managing provide peace of mind over double-bookings. A unique feature is the possibility of having one merchant account per resource for credit-card processing. The system is reasonably priced and modular. Reporting engine is lacklustre. The standard user interface is overly complicated. Although the pricing engine is powerful, there's no way of easily displaying prices without manually entering start/end dates/times. Integration according to our specfic needs was complex and required a third-party. A couple of unanounced system changes were made with a business impact. The experience is solid, good. We did not find better rental software fitting our needs.Planyo has so many features, that every crazy idea we had could be done with few clicks in Planyo. Planyo has so many features, that every crazy idea we had could be done with few clicks in Planyo. The pros are the cons: The complexity of the possibilities by Planyo gives you chances to "do a few clicks" here and there. You might end to not understand every detail the software offers you. So you really have to go deeply into it and try to understand the complexity behind Planyo. Some support pages are not updated at the same moment as the software has been. We run into some hidden limitations (number of resources). Those limitations should be published open according to our opinion. Real-time management of my products and services. Direct online bookings.Great flexibility in pricing and setting up booking criterias using the pricing manager module. Our business is fairly unique to our location so we can't just use an off the shelf system. Easy to link to a website. Very clear calendar view. Very responsive customer service/technical support team. Great flexibility in pricing and setting up booking criterias using the pricing manager module. Our business is fairly unique to our location so we can't just use an off the shelf system. Easy to link to a website. Very clear calendar view. Very responsive customer service/technical support team. To make the most of the system, you need to be quite technical and computer savvy so it's taken a lot of research and trial and error to get the pricing correct however there are options to hire a third party expert to set this up. So perfect and always improving, you'll never want to use another system! Wish the mechanisms were issuing refunds were automated. Wish it wasn't so easy to delete users without reservations. We have 2 pricing models: PRO based on a monthly subscription (price starts at 23 CHF/month and depends on the number of resources) and PRO-COMM based on commissions for customer-made reservations (1% - 1.5% and not charged for admin-entered bookings). You can freely switch between the two models. Off-season months are free. Technical support is also free. - Very flexible booking process: you decide at which point a resource becomes unavailable to other customers, when it's confirmed and how (payment in instalments or full, manual confirmation etc. ), whether to use the shopping cart or additional products etc. Below are some frequently asked questions for Planyo. Q. What type of pricing plans does Planyo offer? Q. Who are the typical users of Planyo? Q. What languages does Planyo support? Q. Does Planyo support mobile devices? Q. Does Planyo offer an API? Yes, Planyo has an API available for use. Q. What other apps does Planyo integrate with? Q. What level of support does Planyo offer? Q. Which apps is Planyo compared to most often?